This San Francisco Relay is "California's Longest Party." 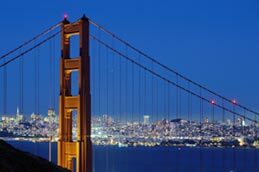 From Napa Valley to Sonoma, Marin, Sausalito, across the Golden Gate Bridge at midnight, through San Francisco, Palo Alto and Silicon Valley to the ocean. Featuring the beauty of the Bay Area, the course boasts many tourist destinations. Each member on a team of 12 runs three legs in rotation. The 36 legs through 36 cities are 3 to 9 miles and rated easy to very hard allowing runners to select legs that match their strengths. Runners of all abilities are challenged, contribute and have a great time. "Indian Tribes Will Participate in Great California Marathon" declared the Sausalito News on April 2, 1927. As "the longest endurance contest ever," the 480-mile foot race through 7 counties between Sausalito and Grants Pass, Oregon, commemorated the beauty of the Redwood Empire. Teams from nine tribes competed for $2,775 in gold. Signal fires and tribesmen performing age-old dances greeted runners along the way. After many battled for the lead, Mad Bull from the Karook tribe finished in 7 days, 12 hours and 34 minutes. Much has changed since 1927, yet similarities remain. A fire at Point Reyes billowed smoke through Marin and Sonoma signaling the start of the GGR in 1995. 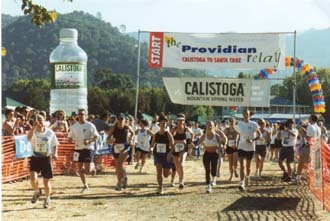 Showcasing the San Francisco area through seven counties, nine teams ran from Calistoga to Santa Cruz. Runners dance along the way. The "waiting for the porta-potty" dance is especially popular. The Latin derivation of competition is seeking our best with the help of others. A relay is not about being the fastest, but learning what it takes to be a winner. The focus is 12 runners working together, giving their best for the team. Surmounting adversity, helping teammates and other teams, running in the moonlight and making special friends are all part of the GGR romance. After entering 6 teams, Google commented that the Golden Gate Relay was a fantastic team building experience by reinforcing values that employees need to create a winning company. Since 1995, the transfer of the baton from runner to runner has symbolized the transfer of an organ from donor to recipient. The GGR has been dedicated to transplant recipients, candidates, organ donors and donor families participating as runners, walkers, volunteers and guests. Discus your personal wishes regarding organ donation with your family. Register online as an organ donor. Since 18 die each day before an organ is available, solicit online donations and/or ask your employer to match your entry fee with a tax-deductible contribution to ORU. Google 1 will defend its many GGR championships against Apple, Facebook, Stanford, Twitter, Yahoo! and others. 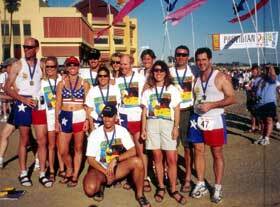 With four Olympians, the 2000 Sportbrain team set the course record of 17 hrs., 55 min. Team Dean (Karnazes) has won fifteen ultra titles. It will take strength, strategy and endurance to reach the finish. It will take cooperation, sensitivity and understanding to travel many miles with sweaty bodies. Conquer as a team what few dare to face alone. Quench your thirst for challenge and discovery while celebrating life, running and teamwork. © 2015 THE RELAY. ALL RIGHTS RESERVED.